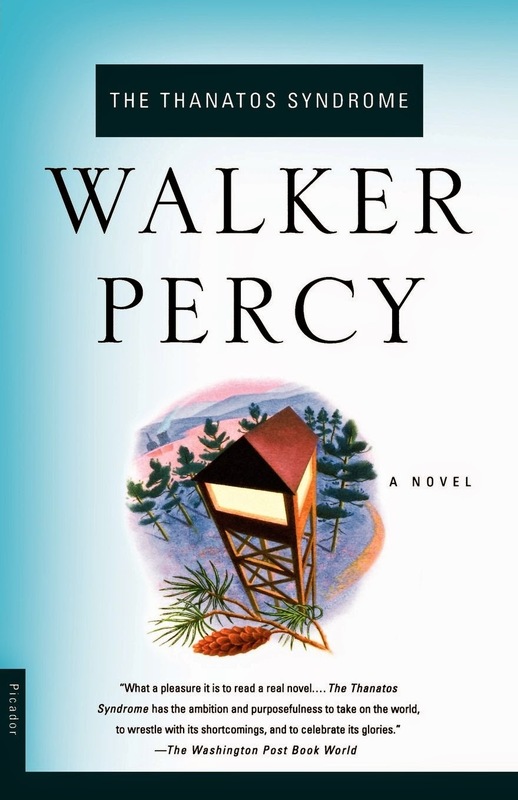 Over the summer I got together with some teacher friends to read and discuss Walker Percy’s Love in the Ruins, his wildly funny dystopian satire written in the early 1970s. It’s a grab-bag of a book (“everything in it but the kitchen sink,” Percy once told the Paris Review) and I couldn’t get enough of its odd mix of science-fiction, philosophy, ribald humor, and eerily prophetic descriptions of American life in the 1990s, as he imagined it. I then re-read, for the first time in a dozen years, The Thanatos Syndrome, Percy’s loose sequel to Love in the Ruins. It is more focused in scope (though less funny) than Love, and Percy is able to more fully develop some of the ideas he raised in the first book. He resurrects the protagonist, Dr. More, to save his fellow Louisianans from several scientists and social engineers who have secretly laced the area’s water supply with brain-altering chemicals in an attempt to reduce psychological and social ailments in the population. This chemical dosing cleans up much of the messiness of human society—violent crime plummets, teenage pregnancy is eliminated, etc. but Dr. More rightly sees it for what it is: a social experiment that employs advanced science to serve the goals of a select few. More conceives of his enemies in Louisiana as newer versions of the German scientists whose advancements in eugenics resulted in the Holocaust, and throughout the book, Percy suggest that the social engineers (who also happen to be enthusiastic child molesters, by the way) are not at the freakish extremes of scientific and social progress but are a natural extension of the Enlightenment itself. Catholicism, in Love in the Ruins and Thanatos, especially in the latter, is not a living, breathing, faith. Percy’s characters are not saints, nor are they converted by the pious actions of others. Instead, Catholicism is a compass of sorts, a sound ideology, long-discarded by society, foreign to most everyone, but perceived by those, like Fr. Smith and Dr. More, who recognize its importance in keeping society from destroying itself. In Percy’s eyes, it is the only choice, given the alternative. At the end of the novel, Fr. Smith, fresh from his self-imposed exile in a firetower, proclaims to a congregation of doctors, “Tenderness leads to the gas chamber.” In other words, without a sense of higher purpose, all human achievement ultimately serves utilitarian ends determined by the most powerful individuals. Attempts to improve society, to pursue greatness in science, the arts, etc., eventually end up in places like Dachau, Percy wants us to believe, unless they are grounded by faith, specifically, in Catholicism’s teachings on life and human dignity. Of course, I wouldn’t be writing this if I didn’t think Percy was onto something important. And in starting this blog (and the school year), I think it’s relevant to consider how Percy’s wisdom might apply to those of us who teach and work in Catholic high schools, we who have a bigger job than just prepping our students to be well equipped to enter the Grand Western Technocracy. Sure, we want to encourage our students to excel in all they do—in their Science and History and Math and yes, even Literature classes. But how is the way we encourage them to achieve going to be different than the way other schools encourage them to achieve? Ask students why it’s important for them to learn the periodic table or read Shakespeare or study the Civil War and some might answer that it’s important to get good grades. Some might say that it’s important to try your very best. Some might even say that it’s important to be knowledgeable about the world around us. True responses, of course, but a student at a Catholic school should know—even if he or she doesn’t agree—that our faith offers a deeper answer. If Percy is right, if choosing human progress for its own sake is like choosing death, then how will we help our students choose life? This blog, at least for now, will revolve around these questions, especially in relation to teaching Literature in a Catholic school. I’m not sure what I’ll end up posting yet—thoughts, links, reviews, suggestions, lists, probably lots of stuff, and I’m sure posting will be scarce at points during the academic year. I think it will be helpful to me to have an outlet for some of my ideas, and I hope it will be helpful to others as well. Thanks for reading!